A SCHOOLBOY punished in December 2014 for shaving his hair for charity has seen his fund-raising total rocket to more than £16,000. Stan Lock, 13, decided to lose his thick brown hair after a number of friends and family were struck down by the disease. He had the trim after setting up a donation page for Macmillan Cancer Support. 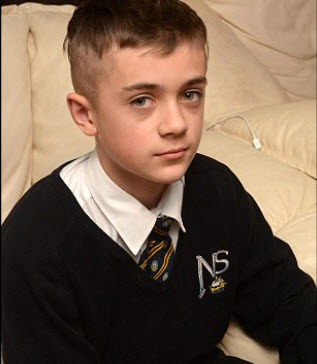 But he was devastated when he was told his number zero hairstyle was against his school’s rules. He spent a week in isolation at Churchill Academy in North Somerset. But despite having a target of £100, he had raised £16,270 by yesterday. His mother Mel Rees, 47, of Compton Bishop, said: “The support we have had has been amazing. This entry was posted in Uncategorised and tagged Charities, charities, fund page, Macmillan Cancer Support, schoolboy by Focus on Disability. Bookmark the permalink.